Venue: Signal Iduna Park, Dortmund. Date: Sunday, 7 September. Kick-off: 19:45 BST. Coverage: Live text commentary on the BBC Sport website and live commentary on BBC Radio Scotland. Darren Fletcher says Scotland's players are relishing the opportunity to topple world champions Germany in their opening match of Euro 2016 qualifying. The sides meet in Dortmund on Sunday night and Fletcher has revealed there is a buzz about the Scotland squad. "There's great excitement coming here and what a challenge it is," he said. "You've got to look forward to that challenge and not be scared of it - you have to embrace it. What a scalp it could be." The qualifier for France 2016 marks captain Fletcher's return to competitive action for Scotland, following a lengthy spell on the sidelines due to illness. And the 30-year-old insists facing a side of Germany's calibre at Signal Iduna Park is the perfect setting to restart his international career. "It's great to be back but I always felt I would be back. It's a great occasion," he added. "I've never played at the stadium before and what an opportunity to play against the world champions in their first competitive game (since winning the World Cup in Brazil)." Germany lost 4-2 to Argentina on Wednesday in a friendly and are facing personnel issues ahead of the match. They have been hit with a number of injuries in defence and are without three of their World Cup-winning squad following the retirements of Miroslav Klose, Per Mertesacker and Philipp Lahm. But Fletcher is not expecting their level to drop. "We know what to expect from them," he said. "They may have a few players retired and missing but with the strength in depth they've got, and quality they have, we're expecting a fully-fit, top-class Germany team. To prepare for it any differently would be a big mistake." Fletcher, however, says Scotland go into the game with confidence on the back of a six-game unbeaten run. And he was unhappy when asked about the Scotland players by a German journalist. "I think it's a bit disrespectful that you don't know too much about the Scotland team to be honest," he said. "We've got a lot of good players, we play in the Premier League, a lot of us, we're on an unbeaten run and since the manager came in there's been a massive improvement in the team. "We've worked on what we do when we get the ball and we'll try to be positive when we get the ball, try to create openings and attack. "It's the start of a new campaign for us and we're in a good place just now, but we need to do it when it counts and we want to qualify for a major competition - it starts by trying to get a result here." 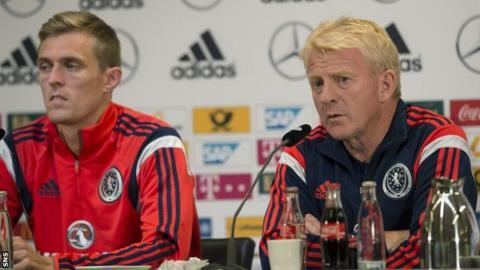 Scotland boss Strachan is also confident his side are well-placed to face a side of Germany's quality. "Is it the best time to play Germany? For us it's a good time to be playing together," he said. "We're in a good place at the moment and we're respectful, we understand how good they are, but we're happy with what we've been doing in the last year. "We know how we're going to play, we know the formation. Every player will now exactly what's needed from them."